On Friday afternoons, I take the role of Simon Cowell. The British television personality came to fame through his notoriously harsh criticism of talent show contestants. His ability to slam anyone and everyone's attempts on stage got him both a talking wax work model at Madam Tussaud's (where visitors could enjoy being insulted themselves) and a spot on every future talent show on both sides of the Atlantic pond. 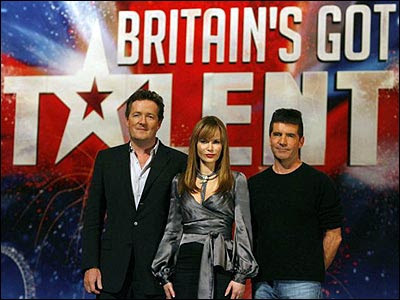 Fun fact: Before appearing on 'American idol', Simon Cowell had his teeth veneered to give him the showbiz white smile. This move was ridiculed in the UK, where cosmetic dentistry is frequently viewed as excessive vanity. As a side note, the view that Brits actually have bad teeth is not correct (at least, not my generation and below) but having work done for pure aesthetics is still relatively uncommon. The afternoon on the last day of the week is the time for our research group meeting. In this hour, a hapless student is made to do a presentation in English on a research paper they have recently read. Bearing in mind that such publications are frequently jargon-heavy, excessively long turgid reads that often refer back to a string of previously published works by the same authors, this is not an easy task. This week one of my own students was on the podium and he was doing an admirable job. While still struggling with speaking English fluidly, he had put together a comprehensive review of the paper, pulled out the relevant highlights from past related works and added helpful diagrams to demonstrate some of the newer concepts. None of this stopped me tearing him apart limb from limb. Really, he loved it. If he shows up again on Monday. The first is that paper writing isn't designed for presentations. Sentences tend to be long and heavy with technical terms than may (if you're lucky) have been defined in an earlier section. A presentation, on the other hand, needs to have short pithy comments that people can quickly glance at while you're speaking. The second problem is that --since the sentences are long and technical-- I knew my student would never have written them. This leaves me wondering if he has truly understood the underlying concept. Finally, since I am the only native English speaker in a group that consists of many 4th year undergraduates and Masters students, using such constructs doesn't help the audience understand the presentation. This led to each slide presented being dissected and re-explained. Sadly for me, the answers left little to insult. I wasn't able to use any of the lines I had planned. Not even "You're like a singing candle. You just stand there and melt." or "I won't remember you in 15 minutes." or "Did you really believe you could become an American Idol? Well, then you're deaf.". I couldn't even slide in Shut up and start singing.". … Although admittedly if I had we would still be in the seminar room now while I attempted to explain why I had compared my student to a candle, demonstrated serious memory problems, promptly forgotten we were in Japan and then suggested he set his thesis work to music. At the end, I just had one final question: "On your 4th slide, what is the difference between the data given by the black line and that by the blue?" My student explained and then looked at me expectantly. "I actually don't know," I admitted. "It was a genuine question."